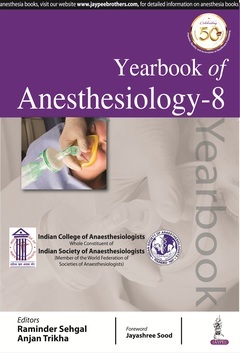 Yearbook of Anesthesiology-8 is an up-to-date guide to the latest advances in anaesthesiology practice. Comprising 25 chapters covering all three specialties associated with anaesthesiology ? regional and general anaesthesia, pain, and intensive care - this book presents the most recent information in the field, in a concise and highly illustrated format. The book covers the complete field from techniques and post-surgical recovery, to pharmacology, non-technical skills and medicolegal issues. This new volume features chapters on obstetric anaesthesia and analgesia, implications of clinical practice guidelines, renal replacement therapy, management of organophosphorus poisoning, and failed epidural block. The final chapter of the book - Journal Scan ? covers recent articles published in respected journals, accompanied by reviews and interpretations by experts in the field. Clinical Practice Guidelines: Medical Tool or a Legal Noose?